Squiriferous: (adj) having the character or qualities of a gentleman. Sugar Bush Squirrel* is the definition of squiriferous, wouldn't you think? So why the crazy squirrel? Rebecca pointed me to Save the Words where I adopted squiriferous for my own. It made me think of squirrels....squirrels in suits. 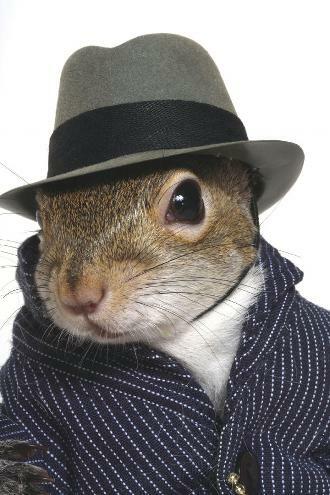 And of course you can find pictures of squirrels in suits on the internet. Do you even have to ask? That's what a squiriferous squirrel looks like. What would he say? "Pardon Me. Do you have any Gray Poupon?" So what do you think a squiriferous squirrel would say? *I also thought "What the hell...?" when I saw that squirrel site, just so you know. This totally makes my day. You, lady, are not a foppotee. I'm gonna make him an offer he won't refuse. Okay, so that's maybe more Godfatheriferous.